Leading Manufacturer of natural amaranth seeds from Unjha. 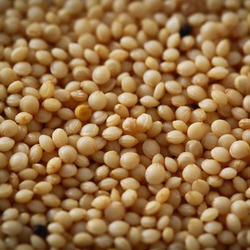 We bring forth for our clients an extensive range of Natural Amaranth Seeds. Offered seeds are used for ulcers, diarrhea, and swollen mouth and throat. The entire range is processed under clean environment so that they can be stored for long. Moreover, the entire range is strictly tested on different parameters of quality in order to deliver faultless range at clients’ end. Looking for Amaranth Seeds ?